If you have ever discussed appraisal work with an appraiser, you know that the topic of “comparable sales” is mentioned early and often. Sometimes simply called “comparables” or “comps,” these sales are the basis for any truly objective fair-market value of real estate. The property which is the subject of the appraisal is rarely one-of-a-kind: other properties comparable to it have sold somewhere at some time. A sizeable amount of the appraiser’s labor is locating and researching these comparable sales for use in his appraisal reports. These sales are the evidence supporting his opinion of value for the subject. Therefore, to understand an appraiser’s work well enough to approve or disapprove of it, we must first gain an understanding of how sales are judged to be comparable to a subject property. The reports of some appraisers can be easily discredited by exposing the atrocious differences between the subject and the comparable sales. Conversely, an appraiser may be fiercely criticized for his opinion of value, but such criticism is greatly undermined if his comparable sales truly are comparable to the subject. This is just an application of the old axiom about comparing apples to apples, rather than to oranges. This article is meant to help our valued clients better understand the selection of comparable sales for residential, agricultural, and commercial appraisals. With such knowledge, we certainly expect that our customers will see the integrity of our conclusions, but they will also be better able to suggest helpful corrections to our reports if such corrections are truly necessary. At Spurgeon Appraisals, we greatly value any information you can provide us regarding comparable sales, so this article could even help you to help us improve our services. (1) Comparable sales must be sales. In other words, the property being compared to the subject must have actually transferred to a new owner, who gave money for it. This is why some appraisers will not refer to "comparables" or "comps": it is not enough for a property to be comparable; that comparable property must have sold. The idea is simple enough, but not everyone appreciates that sales provide the most reliable data for appraising real estate. For example, people have occasionally disputed our opinions of value based on listings of similar properties. However, merely listing a property for sale at a certain price proves nothing about its fair-market value: listing prices and sale prices usually differ by hundreds or even thousands of dollars, making listings generally unreliable for developing a fair market value. Sometimes we are required to provide current listings of similar properties in our reports, but the true basis of our conclusions is the comparable sales. (2) Comparable sales must be comparable. The foundational idea of a comparable sale is that market buyers pay a similar amount of money for properties which are similar. However, this common-sense notion is often forgotten when interested parties become involved in the appraisal process. If they want a subject to be valued lower, they propose “comparable” sales of lower-quality real estate. And if they want a subject to have a higher value, they do the opposite. But this is not the proper method for developing a fair-market value: comparable sales must involve properties truly comparable to the subject. This principle connects with the concept of Highest and Best Use. Properties are only comparable to one another if they have a similar Highest and Best Use. 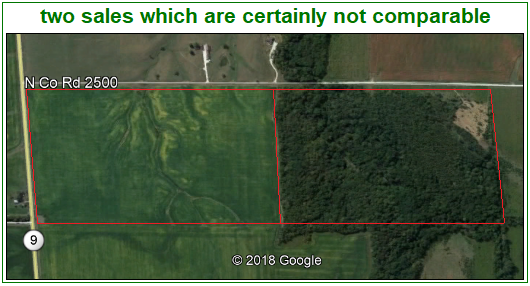 That is why the two properties in the map below should never be compared to each other: one has a Highest and Best Use of row crop farming while the other is recreational. (3) Comparable sales must be plural. At Spurgeon Appraisals, we often need to remind interested parties that “one sale does not make a market.” It is possible for one seller to sell one property on one occasion to one buyer for a bad price. Even if the property is similar to the subject, and the sale was successfully closed, one sale is not sufficient for creating an opinion of value, because one sale alone can be misleading. But multiple, unassociated parties are less likely to make the same exact mistake on multiple distinct occasions. Therefore, only a plurality of comparable sales, all involving similar properties and similar sale prices, can justify an opinion of fair market value. (4) Comparable sales must be as close as possible in time and place. Since real estate values vary over time, the truly comparable sale will be as contemporaneous as possible to the effective date of the appraisal. The same principle holds true for geography: since land sales vary from place to place, comparables sales are best selected from the same market area as the subject. If we can imagine a contest between two appraisers to provide the most accurate opinion of value, the appraiser most likely to win is the appraiser with comparable sales closer to the subject in time and place. At Spurgeon Appraisals, we care deeply about following these four principles for comparable sales. We even employ a full-time sales researcher who consistently checks multiple sources for such sales and researches them thoroughly. When our customers order an appraisal from us, they can rest assured that the finished report will be based on quality data correctly applied.